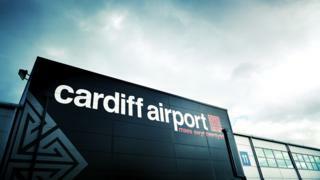 Plans to boost the number of domestic routes from Cardiff Airport are being held up by the UK government, the Welsh Government has claimed. Ministers want to exempt flights to London, Manchester and seven other destinations from air passenger duty. Applications need to be made via UK ministers to the European Commission, but the Welsh Government said they had been withheld without explanation. The Department for Transport said it continues to engage with ministers. Under the public service obligation scheme ministers could exempt flights from air passenger duty, removing £26 from the cost of a return journey, and offer airlines the chance to run the routes exclusively for four years. Ministers hope that will serve as enough of an incentive to attract airlines to nine routes. The Welsh Government hopes to entice air companies to operate flights from Cardiff to London, Manchester, Leeds-Bradford, Humberside, Newquay, Inverness and Norwich. Proposals also include doubling the daily return service to Glasgow, and offering a direct return service to Aberdeen instead of the existing indirect route. A Welsh Government spokeswoman said it had submitted applications for a range of "Public Service Obligation" routes to the UK Government's Department for Transport. "As the member state, the UK government is responsible for sending the proposals to European Commission for consideration," she said. "Unfortunately, the UK government is withholding our applications without satisfactory explanation." The spokeswoman said this may be linked to the issue of air passenger duty, which the Welsh Government wants to see devolved as it is in Scotland. The Department for Transport said air passenger duty is dealt with by the Treasury. It added: "Through Aviation 2050, we are currently consulting on proposals for public service obligations. "This includes continuing to use them to support lifeline services that connect regions, as well as expanding the scope to routes into airports that provide onward connectivity benefits to long haul destinations. "The UK government will continue to engage with both the Welsh Government and Cardiff Airport to ensure their views are considered before publishing the Government's policy on Public Service Obligations in the Aviation 2050 White Paper later this year." On Monday it was announced that Eastern Airways will continue to operate the Cardiff to Anglesey air route for another four years, after a new contract was awarded. The route to Anglesey has seen passenger growth of around 40% since Eastern Airways took charge of the service, the Welsh Government said. It has run the route after its previous operator, Citywing, went into liquidation in March 2017. The route was given almost £2m in subsidy in 2017-18. Transport Minister Ken Skates said he hoped Eastern Airways's plans to grow the route will include the company "operating its Jetstream 41 at the full capacity of 29 seats, offering 50% more seats than it is currently able to offer". Last year AMs were told plans for a larger plane to serve Anglesey had been refused by the UK government on security grounds.